New commemorative US stamps were issued, beginning in 1926, to mark significant events in American history. With 1926 being the anniversary of the Declaration of Independence and the beginning of the Revolutionary War, there would be many issues to come. During 1926, and for several more years, there were stamp issues marking the accomplishments of famous American patriots and anniversaries of the decisive events that took place during the American Colonial struggle for independence from Great Britain. Though there were many stamp issues during this period, the Bureau of Engraving and Printing showed remarkable restraint in the number of commemorative stamps that they issued. Most of them were single-stamp commemorations, and with few exceptions, they were all first-class letter-rate denomination stamps, instead of the useless high-denomination commemorative stamps of past years. The 2 Cent denomination commemorative stamp shown above (Sc. #627) was issued May 10, 1926 for the Sesquicentennial Exposition, held in Philadelphia, Pennsylvania June 1 to December 1, 1926, and to commemorate the (upcoming) 150th Anniversary of the Declaration of Independence. This 2 Cent stamp features the Liberty Bell, originally in the steeple of Independence Hall in Philadelphia. Now, it is in a museum adjacent to Independence Hall. The Sesquicentennial International Exposition of 1926 was a World's Fair, held in Philadelphia, Pennsylvania, to celebrate the 150th Anniversary of the Signing of the Declaration of Independence and the 50th Anniversary of the 1876 Centennial Exposition. The commemorative stamp shown above (Sc. #628) was issued on May 29, 1926 to celebrate the Unveiling of the Statue of John Ericsson by the Crown Prince of Sweden in Washington, D.C.
John Ericsson (1803-1889) was a Swedish-American inventor and mechanical engineer. He invented the ship propeller and incorporated the device into his design for the American Civil War ironclad ship, the U.S.S. Monitor. The stamp shown above (Sc. #629) was issued on October 18, 1926 for the International Philatelic Exhibition in New York City and to commemorate the 150th Anniversary of the Battle of White Plains, N.Y. The 2 Cent denomination stamp depicts Alexander Hamilton's Battery. The Battle of White Plains was actually fought on October 28, 1776. The engagement, near White Plains, N.Y., was fought between the Continental Army of George Washington and the British / Hessian Army of John Howe. Though casualties were very low, the result was not pleasant to the Americans. John Howe's army won the day, and George Washington's Continental Army retreated northward. 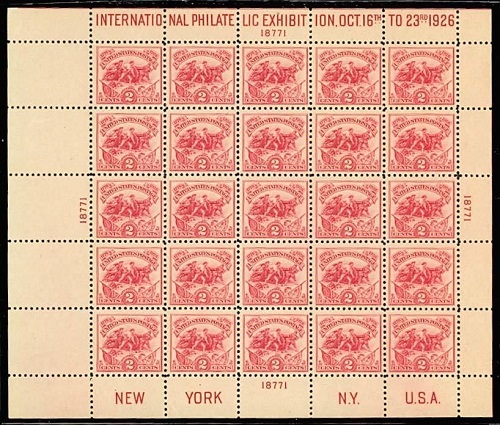 Souvenir panes, containing 25 White Plains stamps, were issued at the International Philatelic Exhibition. One of them is shown above (Sc. #630). This "souvenir sheet" was the first of its kind. Only 100,000 were printed and many of them were broken-down to sell as margin singles and margin blocks. The sheets were actually unpopular with collectors of the day. Today, the sheets bring quite a bit more than the 50 Cents they originally sold for at the exhibition. Though a bit pricey, they are not beyond the reach of most US stamp collectors. The commemorative US stamp shown above (Sc. #643) was issued on August 3, 1927 to commemorate the 150th Anniversary of Vermont Independence and of the Battle of Bennington. The 2 Cent stamp features a Green Mountain Boy of Revolutionary War fame. The Battle of Bennington was a battle of the Revolutionary War, part of the Saratoga campaign, that took place on August 16, 1777, about 10 miles from Bennington, Vermont. A rebel force of 2,000 men, composed of New Hampshire and Massachusetts militiamen, and reinforced by members of the Green Mountain Boys, decisively defeated a detachment of General John Burgoyne's army. The battle reduced Burgoyne's army by about 1,000 men, led his Indian support to largely abandon him, and deprived him of needed supplies, such as horses and food. The Green Mountain Boys were a patriot militia during the American Revolution. This militia was created in 1770 near Bennington (Vermont). At that time, what is present day Vermont was an area known as the New Hampshire Grants, controlled by the British Colony of New York. The militia was formed to protect the local land owners from attempted settlements by their neighbors in New York. The Green Mountain Boys joined the American Revolution in 1775, under the command of Ethan Allen. The commemorative US stamp shown above (Sc. #644) was issued on August 3, 1927 to commemorate the Saratoga Campaign and the Surrender of General Burgoyne at Saratoga. The Saratoga or Burgoyne Campaign was primarily the Battles of Bennington, Oriskany, Fort Stanwix, and Saratoga, which spanned August through October of 1777. The 2 Cent denomination US stamp features "The Surrender of General Burgoyne at Saratoga", an 1821 painting by John Trumbull (1756-1843). The design shows British Lieutenant General John Burgoyne offering his sword to American Major General Horatio Gates, following the Battle of Saratoga on October 17, 1777. This event is considered the turning-point of the Revolutionary War, as it convinced France to join the conflict on the side of the United States.